The marine environment is wild and untamed. Unlike coarse fisheries which are often tailored to comfortable and successful angling, the sea sees Mother Nature totally in control. Large expanses of sea are far more affected by the weather than rivers and lakes, and the sea angler has to overcome not only the natural caution of the fish species he pursues, but the hostile environment they live in. No matter where you fish in the sea, the wind, tide, season, water depth and type of sea bed will all affect the likelihood of catching. Sea angling is one big learning curve, because no single standard technique is guaranteed to work at all venues or at any time of year. Here we look at the basic tactics used on many of the different types of venues and conditions. The most successful sea anglers will be able to adapt to local conditions and fish with an ever-open mind. Fish like a robot and you may catch a few, but stay alert, be aware and you will learn something new about fishing on every trip and improve as you go along – remembering it all is the hard bit! One of the variables that has a major influence on sea angling success or failure is the tide. The seas around the world are influenced by the gravitational pull of the sun and the moon, and this produces a surge of water around the globe as the planets rotate. Water depth and speed is altered constantly by this tidal surge. Two high tides (flood) and two low tides (ebb) occur in every 24 hours, and these advance in time as the Earth spins and the position of the sun and moon changes. Because this is a consistent movement, tide times and heights can be predicted accurately and tide tables are made available years in advance. The shape of the land mass also has an influence on tide times and water depths because the sea is funnelled and directed around headlands and through narrow straits at many points around the coast. The marine habitat and the behaviour of fish is greatly affected by tidal strength and water depth. In general, the more tidal movement there is, the more fish movement there will be. Peak tides on the ebb or flood produce the best results on most venues, but there are exceptions. The shorter tides are called neaps, and they occur when the gravitational pull is at its weakest. The strongest, spring, tides occur when the combined gravitational pull of the sun and moon is at its maximum – the name ‘spring’ has nothing to do with the season. The highest, strongest spring tides are universally recognised as being the best for shore fishing – but they are also the fiercest. Fishing can be quite difficult at such times. The fish use the tide to travel to a food source, coming in on the flood and going back out on the ebb. The weather combines with the tide to produce food. For example, a strong onshore gale and heavy seas will dislodge and kill a lot of marine life. Fish instinctively know what conditions produce the most food, and will home in on it. It is an easy matter to find out the precise times of high and low water, and the strength and height of each tide. Anglers who keep records will soon find that certain venues fish best under a quite precise set of conditions. Tide tables, available from most tackle shops, provide the basic information, and it is then up to the angler to interpret them from past experience. Knowing the tide height and times are essential to the angler who digs his own bait, because spring high tides see the sea retreating the furthest, often exposing virgin sea bed which is a goldmine to the bait-digger. 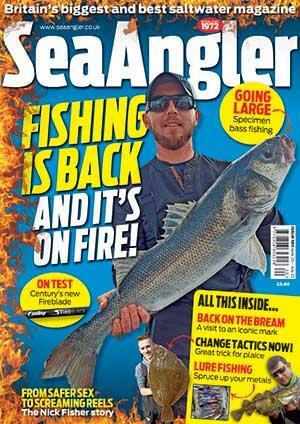 By far the biggest problem for the shore-based sea angler is keeping the tackle still on the sea bed in a strong tide. The more line in the water, the greater the pressure on the lead, and so wired grip leads are used to combat the strongest tidal movement. Breakout wires snap open when tackle is retrieved, making their recovery easier, but in extreme tidal conditions fixed grip wires are essential. There are other factors that come into play in holding your rig and baits in place on the sea bed, and certainly line diameter has a great effect. The larger the diameter of the line, the more it opposes the tide and the more it is likely to be dragged into a bow downtide. Lower diameter lines offering less resistance are most efficient with 0.35mm (15lb breaking strain) line, the standard for combating strong tide. Casting slightly uptide to allow for the movement of the tide is acceptable, but take care not cast over another angler’s line. Heavy leads sink the quickest, and are worth considering in deep water and strong tide. Anglers can use the tide to move their rigs and bait in a positive way – floatfishing or freelining a bait are productive methods for some species, although many bottom feeding fish will not take a moving bait. Plain leads can be used in the same way as a float, to trot a bait downtide or allow it to move into a slack or eddy where food may also collect. • Adding rig tubing to the ends of grip wires assists grip in sand. Short wires grip better in mud, while long wires are easier to ‘spring’ out. • The wires on breakout leads are adjustable, and can be loosened or squeezed tighter so that they grip and hold better – check and reset every cast. • Once a lead is dislodged, especially when the breakout wires have come unclipped, tackle will be swept downtide. Retrieve, and reset the grip wires, or replace the lead with a more efficient size or pattern.